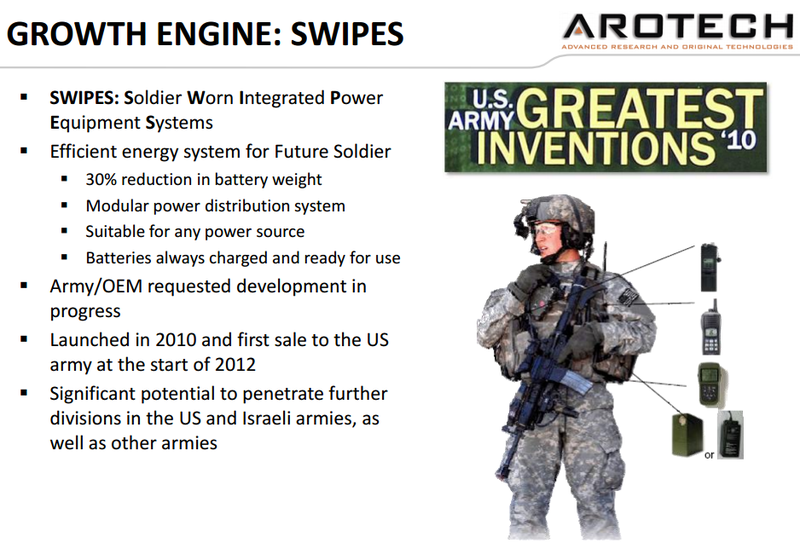 An exciting ARTX product called SWIPES was named by the U.S. Army as one of the greatest inventions of 2010. U.S. Marines and Israeli Armed Forces may start ordering SWIPES. With skyrocketing demand for UAVs, drones and other unmanned vehicles, the demand for high-powered lithium batteries should offer huge potential growth for ARTX. Sales of electric cars have yet to eclipse 1 percent of new-car sales, leaving much room for growth for ARTX and its lithium-ion electric-car batteries. Arotech is developing an iron-flow battery to provide storage for grid power. The growth of solar and other renewable-energy sources is driving the demand for more efficient grid-power solutions. ARTX announced record third-quarter results and increased guidance for the full year 2013. In the opening statement of his speech to the Noble Financial conference on Jan. 21, 2013, Tom Paup, CFO of Arotech (ARTX), said, “Our stock is very much undervalued.” We recommend to all investors that they view thatpresentation. An exciting ARTX product called SWIPES was named by the U.S. Army as one of the greatest inventions of 2010. The Army has been reordering the product, and the U.S. Marines and Israeli Armed Forces may start ordering SWIPES after expressing great interest in integrating this product into their issued combat gear. With skyrocketing demand for UAVs, drones and other unmanned vehicles, the demand for high-powered lithium batteries should offer huge potential growth for ARTX. According to its 2014 budget, the U.S. government plans to spend an estimated $4.1 billion adding to its fleet of unmanned vehicles. Sales of electric cars have yet to eclipse 1 percent of new-car sales, leaving much room for growth for ARTX and its lithium-ion electric-car batteries. This state of exceptional growth is best exemplified by the 400-percent increase in the stock of Tesla (TSLA). Arotech is developing an iron-flow battery to provide storage for grid power. The growth of solar and other renewable-energy sources is driving the demand for more efficient grid-power solutions. The iron-flow batteries could revolutionize an industry that is expected to exceed $400 billion by 2020. The simulation, training and consulting division has grown rapidly over the past three years. 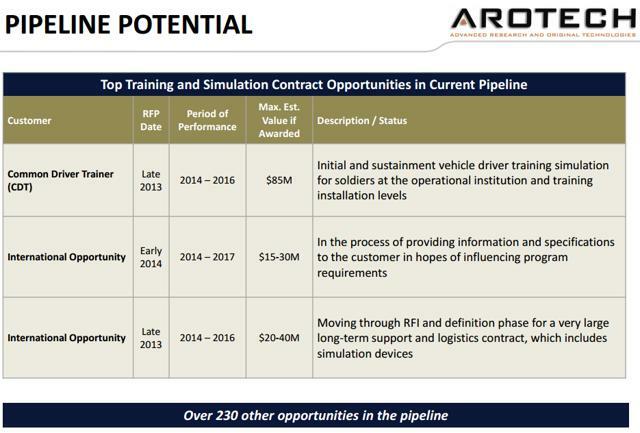 Arotech also has three exciting new contracts, worth a total of $120-155 million, coming through the pipeline, a fact that should help the segment continue its rapid growth. There were two recent mergers within the simulation segment, and we feel Arotech would be an excellent acquisition for defense giant Lockheed Martin (LMT). ARTX announced record third-quarter results and increased guidance for the full year 2013. Given the company’s record (and growing) backlog of $74.4 million and increased guidance, we believe Q4 and full-year 2013 results also will establish new records. 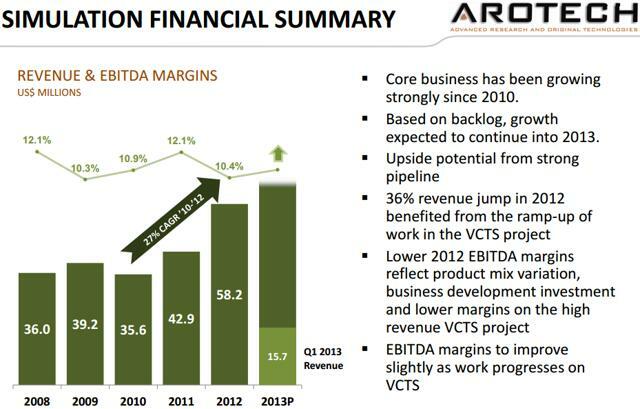 It is a virtual certainty that 2013 will be the first profitable year in the company’s recent past. 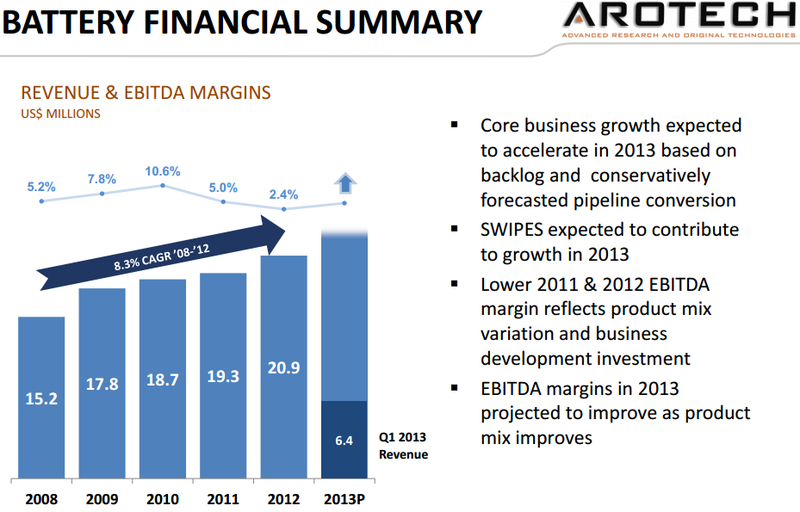 Arotech is cheap, profitable and growing, with unlimited future potential. Arotech supplies batteries and other products for many rapidly growing products such as electric vehicles, drones and grid storage, as well as for various other military applications. The stock recently pulled back from its highs, giving investors a buying opportunity as ARTX is much cheaper in valuation than its peers. Since we began writing articles for Seeking Alpha, this is the most undervalued stock we have come across, and we are even more excited about Arotech’s future. Consequently, we assign a buy rating on the stock with a $16 price target, which is quadruple its current levels. The battery and power-systems division is the smaller of the company’s two segments but offers huge growth opportunities. Below is a list and description of the division’s products and the potential for growth that each offers. Soldier Worn Integrated Power Equipment Systems is one of Arotech’s new and exciting products with a huge potential for growth. The SWIPES system provides a power supply to soldiers to eliminate the need to carry spare batteries for their battery-operated devices, including radios, GPS, flashlights, mine-detection systems and other battery-operated tools. This system is conveniently wired through the Moly vest that currently is in use by the armed forces. The system presently is being used by 7,500 members of the U.S. Army and has huge growth potential in further sales to the Army. Soldiers do not have to carry spare batteries for each electronic device because the SWIPES system powers them all. The system weighs less than two pounds, reducing the soldier’s gear weight in batteries by 30 percent. Trickle charge is provided to the soldier’s radio, keeping it fully charged in the event that it needs to be removed from the system. The need to carry multiple backup batteries, which can be lost in the heat of combat, is eliminated. Here is a link to an informative video on the SWIPES product. The Army has been re-ordering the SWIPES product and voted it one of the “greatest inventions” of 2010. It was stated at the Noble Financial conference that the U.S. Marines and Israeli Armed Forces might start ordering SWIPES and have expressed great interest in integrating this product into their issued combat gear. The electric-vehicle market is in a state of exceptional growth best exemplified by the 400-percent increase in Tesla’s stock. This market is so affluent that Tesla recently announced the construction of a gigafactory capable of producing more than 500,000 electric cars per year. Even with all the excitement around the electric-car market, sales of electric cars have yet to eclipse 1 percent of new-car sales, leaving much room for growth. In 2013, electric-car sales were up 300 percent from 2012, and they are set to continue at a similar pace in 2014. The green revolution is causing a continuing growth phase, with Arotech strategically positioned to take advantage of the market. On March 6, 2014, Arotech announced that it had advanced its development of an iron-flow battery to provide storage for grid power. Arotech is in the process of acquiring a patent for this new technology. These new iron batteries have multiple competitive advantages over the current offerings for grid power. The iron chemistry provides a higher return on investment, a better life cycle and lower maintenance costs than what currently is in operation. The growth of solar and other renewable-energy sources is driving the demand for more efficient grid-power solutions. The iron-flow batteries could revolutionize an industry that is expected to exceed $400 billion by 2020. The simulation, training and consulting division is the larger of the two segments and has grown rapidly over the past three years. Below is a list and description of its products and the potential for growth that each of those products offers. Arotech has become very strong within the simulation and training industry. Arotech offers products for the military, public safety, transportation and airports. Inside these divisions are multiple product offerings. The military-training simulation provides packages that simulate the driving of vehicles, on-the-ground combat, air warfare and air refueling. The public safety simulators are geared toward training of police, fire and EMS personnel, with different packages available to each sector. The transportation simulators train drivers of buses, trains and large trucks. The final simulation package is geared toward operation of airport equipment. Each of these packages offers a superior simulator to develop the end user’s job-specific skills while saving the company or government considerable money. The military market for these simulations is experiencing exceptional growth as more customizable training is demanded. Old training methods are outdated and inferior to the experience Arotech’s simulations provide. According to research by Frost & Sullivan, the total expenditures for Global Military Training and Simulation for 2012 were $36.88 billion. Based on the superiority of simulation to previous training methods, that expenditure is expected to climb to $46.09 billion by 2021. 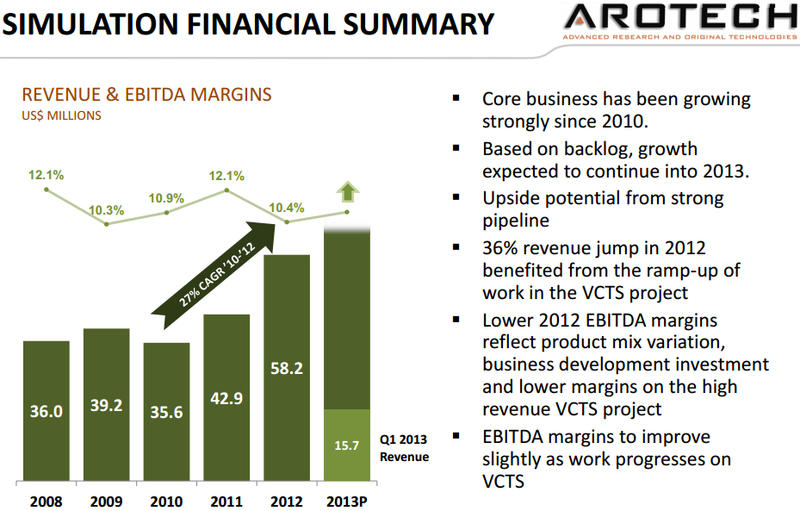 For Arotech, this increased demand will mean many more sales in this division. 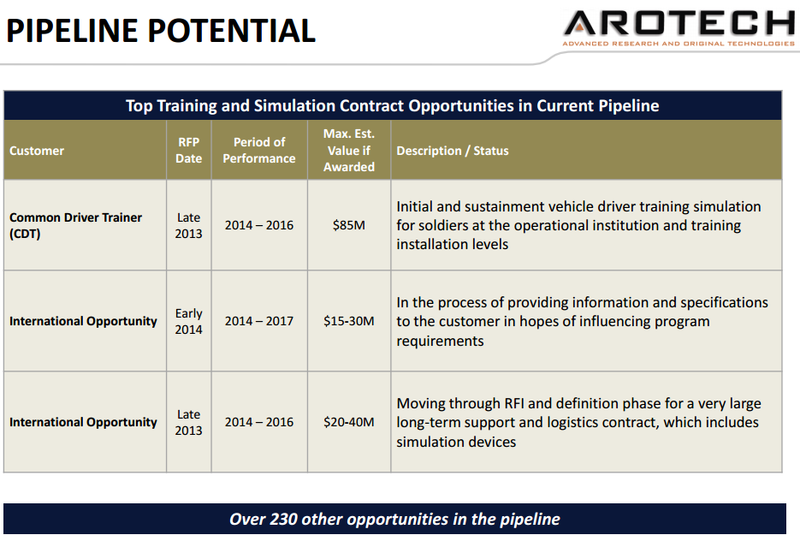 Arotech also has three exciting new contracts worth a total of $120-155 million coming through the pipeline, a fact that should help the segment continue its rapid growth. In the wake of recent acquisitions within the sector, Arotech would be an attractive purchase for many companies in the industry. On Nov. 23, 2013,Textron Inc. (TXT) announced the purchase of two simulation companies: Mechtronix Inc. and OPINICUS Corporation. Both of these companies produce flight-simulation products which TXT will integrate into its flight-simulation and training system to be sold to Boeing Co. (BA), Lockheed Martin Corp., Raytheon Co. (RTN) and other companies involved in aviation. Arotech produces a competing product that is far more robust for military applications than the recent Textron takeovers. On Dec. 23, 2013, Engility Holdings Inc. announced it would be acquiring Dynamics Research Corporation (DRC). DRC is a U.S. government services, IT and management consulting firm. DRC specializes in healthcare, homeland security, R&D, intelligence, surveillance, reconnaissance, defense and logistics. Like Arotech, DRC holds many government contracts and conducts much of its business with the US military. We feel Arotech would be an excellent acquisition for the defense giant Lockheed Martin. Arotech provides advanced military-aviation simulation for fighter pilots as well as training for a military plane’s entire crew. This software also can be used to train military personnel for air refueling. Arotech produces another package geared toward the operation of land-and-sea military vehicles. Arotech’s complete military suite would be an excellent addition to Lockheed Martin’s current portfolio. In addition to the military simulation, Lockheed Martin also could integrate and utilize Arotech’s current military-battery, lithium-battery and SWIPES offerings. ARTX is scheduled to release Q4 and full-year 2013 results on Mar. 31, 2014. Given the company’s record (and growing) backlog of $74.4 million and increased guidance, we believe Q4 and full-year 2013 results will set new records. It is a virtual certainty that 2013 will be a profitable year on the heels of losses in the recent past. This should generate excitement as investors realize ARTX is a great turnaround story with a bright future. We pride ourselves on finding cheap growth companies whose futures are bright, and since we began writing articles for Seeking Alpha, this is the most undervalued stock we have come across. And we are even more excited about ARTX’s future. In order to assign a value to ARTX, we found the best comparable companies we could for each of the battery and simulation divisions. We found ARTX to be severely undervalued and that it has a stronger balance sheet than the comparable companies. 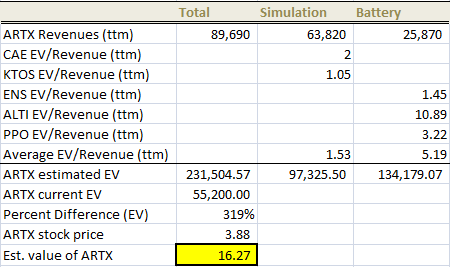 Therefore, we decided to value ARTX through a peer-group analysis using the EV/Revenue ratio. ARTX also is trading close to its book value per share of $2.98. After weighing ARTX revenues by division and averaging the EV/Revenue ratios of the comparable companies, we concluded ARTX should be valued at $16 per share, which is up more than 300 percent from current levels. That is a potential quadruple! Given its unlimited future potential, we believe ARTX will be a story stock for 2014 and beyond. ARTX is a huge opportunity for investors, as it should benefit from the boom for electric vehicles, drones, grid storage and various other military applications. Consequently, we assign a buy rating on the stock with a $16 price target, which is quadruple its current levels. Editor’s Note: This article covers a stock trading at less than $1 per share and/or with less than a $100 million market cap. Please be aware of the risks associated with these stocks. 10 Responses to MID DAY ALERT!! ARTX!!! !